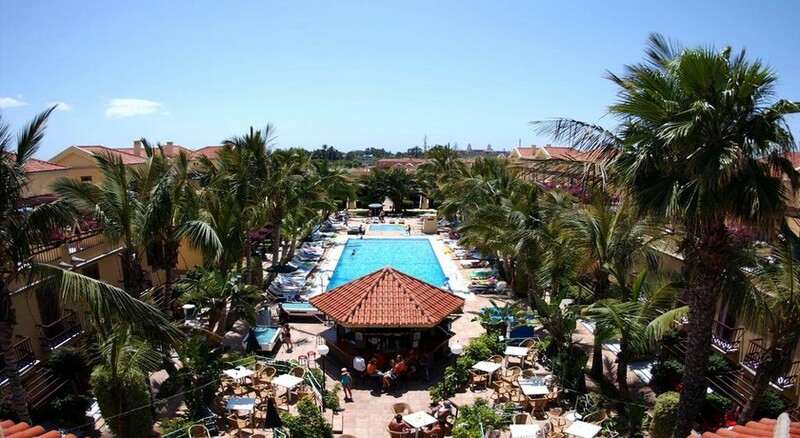 Nestled amidst lush green plantation, the Maspalomas Oasis Club offers luxury and contemporary facilities to make your stay as pleasant as possible. The hotel features two swimming pools, one for adults and one for children, where you will find sun loungers dotted across the pool. Guests can head to the rooftop solarium, where you can spend time working on your tan. 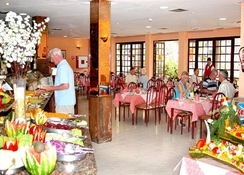 The on-site buffet style restaurant in the hotel makes it convenient for the guests to have breakfast, lunch and dinner. When it comes to sports and entertainment facilities the hotel is one of the best in the area-thanks to the well-maintained volley ball and tennis court. 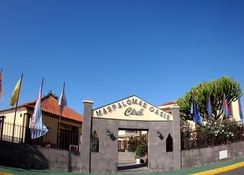 The Maspalomas Oasis Club enjoys a convenient location in Maspalomas, Las Palmas, Spain. Beach lovers will not need to travel too far, as the Playa Maspalomas beach is at a distance of 2.4km, while on the other hand the Playa de San Agustin beach is about 8km from the hotel. Golf lovers will also appreciate the hotel as it is close to the Maspalomas Golf Course, which is about 800 metres away. Those who want to satisfy their luxury shopping needs can hit the CITA shopping centre, which is about 4km from the hotel. The Gran Canaria Airport is about 34km from the hotel. 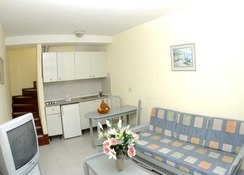 The Maspalomas Oasis Club features 100 bungalows, which are categorised as 84 duplex bungalows and 16 one-store bungalows. They come with all the necessary amenities that are expected by the modern-day traveller. 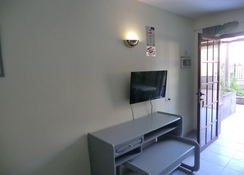 Some of the amenities in the bungalows include sitting room with sofa bed, kitchen, terrace, bedroom with safe (for rent), satellite TV, balcony, In-room service and much more. It must be noted that the top floor bungalows comprise an extra-large terrace. With a buffet-style restaurant serving breakfast, lunch and dinner and a swimming pool bar, guests can enjoy scrumptious meals here. The swimming pool bar is set amidst gardens to give a cosy feeling, while the restaurant’s contemporary interiors exhibit elegance. Other than this, there are a bunch of restaurants and bars spread around the hotel, which will let you explore Mediterranean, European, Spanish, Chinese, Italian and Asian cuisines. 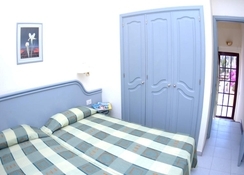 The hotel features a plethora of sports and entertainment facilities to keep the adults and kids occupied during their stay. There is a massive outdoor swimming pool for adults, where you can bask the Canarian sun and relax on the sun loungers, while having refreshing drinks and snacks. At the same time the children’s pool will keep the kids busy. Those who feel energetic can take advantage of the large tennis and volley ball courts or go to the beach by utilizing the free bus service provided by the hotel. Yes, the hotel could do with a lick of paint but it’s absolutely fab for the money. We went as a small group of friends and it suited us fine - €5 to get to town, the beach or the lovely restaurants in Meloneras. We were lucky enough to have a terrace with our room so we could get away from the madness of the pool - lots of kids around but to be expected as this is a very family friendly hotel! Food was decent enough - something for everyone and constantly changing. Drinks were mega strong which was great for us! Only one bartender though so could get quite busy - we made friends on the first day so never really had to wait :) small shop a 2 minute walk away if there’s anything you need but a nice quiet location to relax during the day. All in all, a slightly tired hotel but great staff, clean rooms, food and drink aplenty - far enough away to relax in the day but close enough to enjoy everything Maspalomas has to offer!